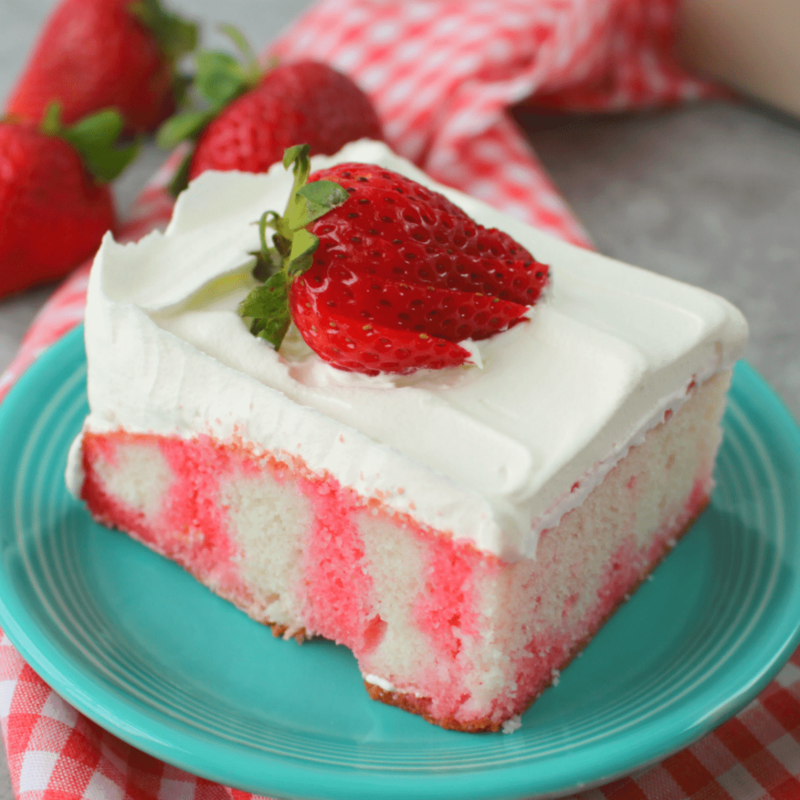 Cool and creamy, this Strawberry Jello Cake is the ultimate summertime dessert! It’ll be your new favorite dessert for cookouts and pot-lucks! 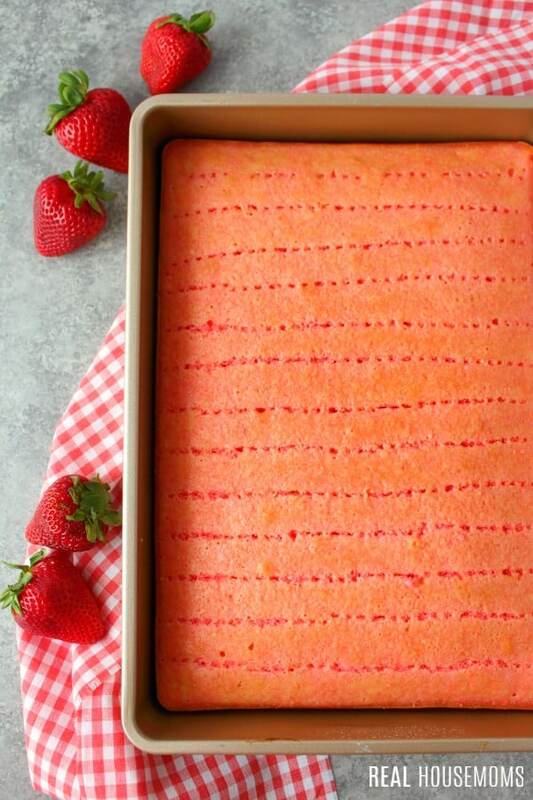 If you love a simple cake dessert, then this Strawberry Jello Cake is for you. Made with just a few simple ingredients, this delicious strawberry dessert is perfect for just about any occasion. Fantastic for your summer picnics, potlucks, and backyard cookouts, this delicious jello poke cake recipe is easy to make ahead, and enjoy with friends and family. My brother Dave’s birthday is July 3rd. As a kid, he never really got to celebrate it with his classmates and friends, as it was smack-dab in the middle of summer, and most of his pals were on vacation with their families for the 4th of July holiday. Because of this my mom always made sure there were plenty of cousins, aunts, uncles, and grandparents around for his Independence Day eve birthday. She also always made his favorite cake – a strawberry jello poke cake. Now that Dave is an adult, he still requests this delicious strawberry cake! It’s also become a July 4th picnic dessert mainstay. It’s a cake you poke holes in after baking. The holes are then filled with flavorings like Jell-O, caramel sauce, a sweetened condensed milk mixture, pudding, etc. The “filling” creates unique internal stripes where it soaks into the cake. These cakes are usually topped with frosting, whipped cream, or whipped topping and garnished with sprinkles, fruit, or candies. Bake a simple white cake in a 9-inch x 13-inch pan. Once cooled, poke holes into the cake with a fork. 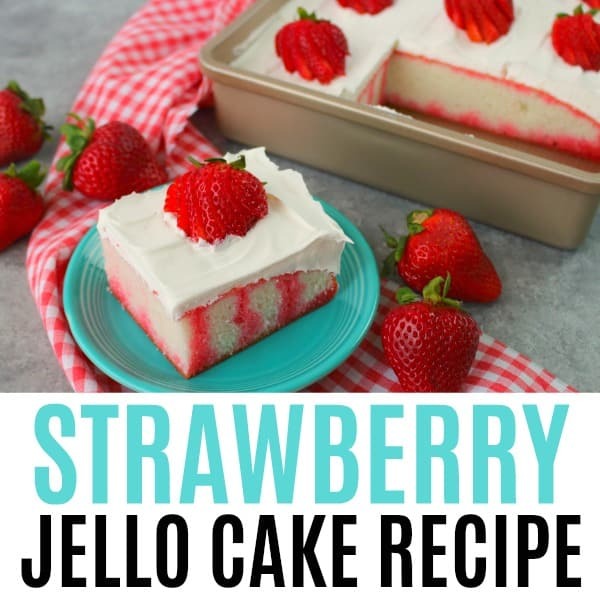 Mix up the strawberry Jell-O and pour it on top of the white cake and into the holes. Because of the Jell-O, the cake becomes wonderfully moist and loaded with strawberry flavor. If you want to make a different flavor jello cake recipe, just change out the Jell-O flavor and garnish to match. To make sure the Jell-O sets up, the cake will need to be refrigerated for at least 3 hours. Once refrigerated, and just before serving, top the cake with whipped topping and strawberries. Homemade cool whip is a great alternative to using a frosting, which can be a little heavy. 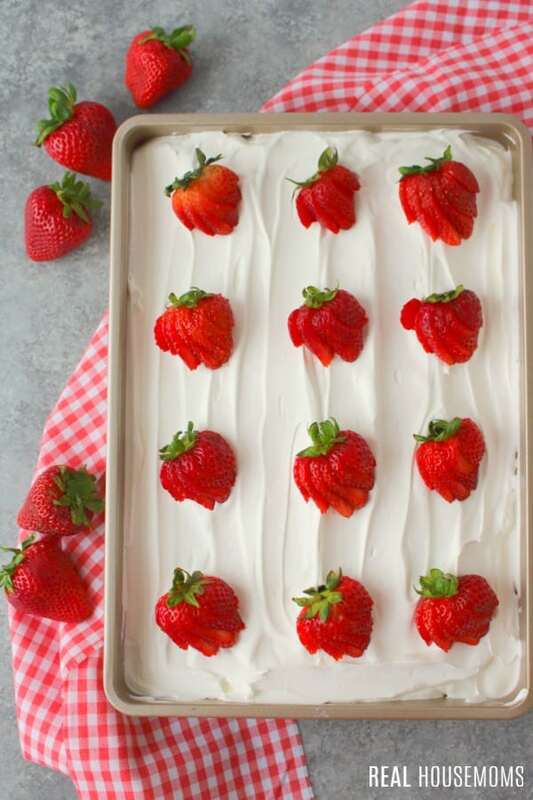 The whipped topping spreads nicely on the Jell-O cake and creates a barrier for topping the cake with sliced strawberries. The strawberries can be kept whole (like in the photos) or the stems can be removed and the sliced strawberries can be placed all over the top of the Cool Whip layer. 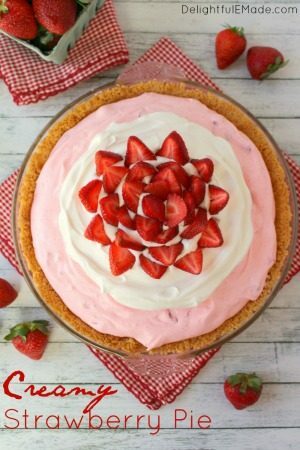 Whichever you prefer, this delicious strawberry jello poke cake recipe is the ideal summer dessert. Try these other poke cake recipes, they’re our favorites! 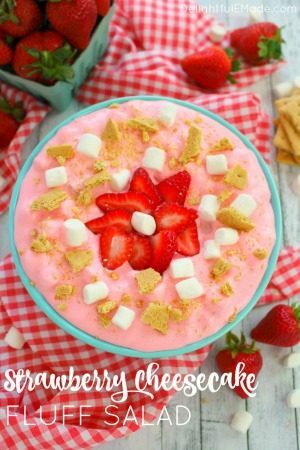 Cool and creamy, this Strawberry Jello Cake is the ultimate summertime dessert! It'll be your new favorite dessert for cookouts and pot-lucks! Preheat oven to 350 degrees F. Grease and flour a 9-inch x 13-inch baking dish. Set aside. Prepare cake mix with water, vegetable oil, and egg whites according to package directions. Bake at 350 degrees for 29-33 minutes. Let cake cool to room temperature. After the cake has cooled, poke holes into the cake with a fork. Boil 1 cup of water; remove from heat. Add in gelatin mix and stir about 2 minutes or until well dissolved. Add 1/2 cup of cold water and stir to combine. Pour the Jell-O into the holes that were poked into the top of the cake, being sure to pour all the Jell-O over the cake. Refrigerate the cake for at least 3 hours to let the Jell-O setup. Once chilled, top the cake with the whipped topping. Add the sliced strawberries for garnish. Slice and serve the cake. Cover and refrigerate any leftovers. I had the cake in the oven but l just wanted to make sure how to finish it. think at my age…72…that l could do this alone but it never hurts to check. I’ve learned that double checking saves a lot of heartaches and disappointments!